An ordinary human with a network of spies and assassins that could threaten Alice's village if she resists. An ordinary human that will be the first man sent to the moon in thousands of years for grossly underestimating who he was dealing with. I think we may get our answers to this question soon. I prefer non-meta threats myself. I'm hoping that Mr Pate is a Lex Luthor, someone who, by sheer personal self-belief, ruthlessness and talent, has become a major power in his part of the world. If he is a threat, it is because he wants to exploit the two space kids for his own ends or considers them 'destabilising elements' that need to be eliminated before they can upset his Master Plan. Could he not simply be the Chief executive of a rather minimal state? I think that is exactly what he is, Jim. That doesn't also stop him from being a mastermind-class Big Bad as well! FWIW, if he's having any dealings with the Praeses, it will turn out that he is conning them quite effectively, taking all they give him and using it for his own interests whilst keeping them working under the illusion that he is their agent and carrying out their interests on Earth. Just to further muddy the water, he is doing that occasionally, when it suits his agenda. While we've been speculating over who Jesper Pate is I'm starting to think the big guy accompanying him may be more than he appears considering Alice's expression. That is not an expression I ever expected out of Alice. I am legitimately intrigued by what could shock her so thoroughly. And as always, Sedan's sass is impeccable. Perhaps Pate's guard is an immortal like Alice and Sedna, but was designed to be simple minded or if one of his eyes is a glass one he may have survived an injury so catastrophic that it left him brain damaged. Either way he would be an invincible henchman that could be easily manipulated by a scheming villain. I want to call him Mongo since I've been watching a lot of Blazing Saddles clips with the passing of Gene Wilder and the general Western feel this strip has. Yeah, I'd say that's a look of recognition on Alice's face. Rather disturbed recognition, at that. She knows him, and is really surprised to see him. My interpretation: "Hey, didn't I kill you the last time we met?" One other possibility is that the big silent man is the real mastermind. He may be an immortal that got bored with being the Big Bad after 5000 years and likes to change things up every so often by playing lackey while actually manipulating the scheming bosses that hire him. As such he may be more Keyser Soze than Mongo. Well lets see how it goes with the usual suspects then. Still, the look on Alices face denotes she either knows him from the past or realises that he just may be the more dangerous of the two arrivals. That expression? Recognition but also fear. There are very few things in this universe that frighten Alice but she's just seen one. I'm wondering... Who watches the watchmen? And who keeps the indestructible super-soldiers in line? I think that Mr Mismatched-Eyes isn't really a person at all but a hunter/killer intended specifically to destroy rogue units like Alice. I wonder how much of his original programming is left? 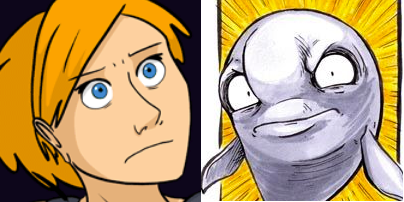 Anyone else notice that Heterochromia Goon again seems to teleport from one looming position to another? You never see him coming. He's just there, looming over your shoulder. Even Alice didn't notice him coming till he was there. What a fascinating way to move. That look on Alice's face... Somehow I think that my theory (call it an "optimistic view" now) of the heterochromia guy being 100% organically grown will not survive for much longer. Well, there isn't a great deal that can frighten Alice so call me intrigued. I agree that recognition was in that expression as well as fear. It could be she recognises him personally as someone that she used to know, but it is also possible she recognises what he is and that is why she's frightened. I eagerly await the next strip to see how frightened Alice is. Is she going to abort the whole mission, grab the space kids and flee? Sit there awkwardly until she sees a good opportunity to flee? Keep following the plan and just stay there while keeping an eye on heterochromia guy? Or was her fear just an involuntary reaction because of her bad history, and she doesn't seriously think she is in any actual danger? I love the art on Jesper in the sixth panel. He really does look like he's acting. The fact that Mr. Pate had to introduce himself suggests, but doesn't prove, that he's a mortal. It would be odd if Alice didn't know someone who had been around for thousands of years. Also, Alice does not show any symptoms of losing her sprightliness. I noticed that too. At first I thought she reverted back because it was unnecessary being at the bottom of the pit where it's shady, but she was still tan when it was night the time she verbally beat down Ardent. Seeing as how it's something she doesn't normally do she's probably still adjusting to it. It might be a good idea to sport a tan right now because if Pate is aiming to abduct the space children he'd be looking allover for a pale girl with red eyes that can float according to the reports he got. Or reverted because they've stopped travelling so she won't be out in the open air in the cart all day. Gavia may be like a chameleon - she'll change her coloring to fit the circumstances. Perhaps she could even turn blue. As superpowers go, it's not as dramatic as being able to fly or shoot lightning bolts from your hands, but I could see it being both useful and fun. You wouldn't need a box. Considering it's the only super power Gavia has right now she might want to employ it more often to avoid potentially getting abducted and to regain some sense of empowerment. It's likely the heterochromia guy is, like Alice, a synthetic AI being of some sort. His eyes don't even have the same dilation. Pate is apparently, per his funding the pit dig and his solar-steam engine "carriage", very involved in acquiring and repurposing old technology for his own use and is an extremely influential and powerful person in that area. I'm going to guess the big heterochromia guy is a less sophisticated AI (than Alice and Sedna) who Pate somehow controls and employs as muscle. The second point is that Alice and he do not know each other which reinforces the point made earlier in the series that she is largely ignorant of what has been going on in the outside world beyond the immediate area of her township. The way Pate is being set up as a character he's going to get very nasty, very fast if he does not get what he wants. It's likely the heterochromia guy is, like Alice, a synthetic AI being of some sort. All the AI's vanished in The Blink. Alice was there in The Blink and did not vanish. Ergo, Alice is not an AI. 1. He didn't vanish during The Blink, so he must not have been on Earth at the time. 2. (this one's my interpretation) "some technologies no longer functioned" after the Blink. I'd interpret that as "really high technologies", which would certainly include AIs. If an AI was dug up on Earth after the Blink, it wouldn't function. So if there's an AI functioning on Earth, he must be a tourist like Ardent and Gavia. I'm pretty sure that it's a glass-eye and not heterochromia. Alice's alarm (I'm not sure it's simply fear) could be because she realises that what she believed to be the truth about this has been violated. "What are you made of?" is actually a really good question and one to which I would love to learn the answer. Or it could be a cyborg augmentation. In the web-comic Crimson Dark, cyborging to a totally ludicrous level is perfectly legal so long as they don't replace/heavily augment the brain, effectively turning the subject into a synthetic in a partially-meat body. I'm just wondering if this guy is something like that. Could be. I've decided that the backstory page I just linked to is the absolute truth, as Alice sees it. None of her actions and theories make sense unless she believes that backstory. But she could still be incorrect. Sedna confirmed that Alice doesn't lie, but that doesn't mean she's right about what happened to the AIs. It may just be her interpretation of history based on what she saw and put together through the years. As such the big man could be the first AI she's seen since the blink which has her both shocked and scared because so far the only thing that has scared her is Ardent's potential to restart all the old conflicts. He's someone she never expected could be a problem and if the big guy is an AI then that could be all the more unnerving since she hasn't seen one for thousands of years. If we hold to the position "all AI vanished" as hard fact then we have two (Alice and Sedna) "entities" that are virtually immortal, capable of surviving being in molten rock, sprouting armor and breaking reinforced concrete. If these aren't advanced tech based constructs or magic we're not left with a lot of options and nanotech is not one of them since the nanotech gobbler had no interest in them. One thing that has come across re Alice's comments is that while she knows a lot of things she doesn't know everything so the door is open to surprises. The other issue is that whatever changed the earth in the blink changed time and physics as well since there are "new stars" in the sky and physical laws are changed. This is way beyond the (stated so far) tech of the Prases or the AI faction and speaks to a God level entity behind the scenes somewhere if Jeph is going to hold true to his stated world creation. If she isn't lying, then she believes all AI's vanished. If she is an AI, she doesn't know it. And she is smart, and has had 5000 years to wonder how her body got so awesome. She would know. She did mention a biotech faction that made wonderful things, strong enough to be evenly matched with the techno faction. I can only assume she is one of them, the biotech constructs. Absolutely. The Blink was caused by a godlike entity. That entity has not yet chosen to appear. Heterochromia Goon[...] looks like he was badly broken and put back together uncarefully. I'm going to reiterate this and posit further that Alice broke him and Mr Pate put him back together. On the whole Jeph seems pretty savvy about science so unless we're tossing real world science out the window and adopting Marvel Comics physics "biological" based lifeforms cannot morph armor with visors out of nowhere and more specifically survive molten lava temperatures. Unless we're introducing force fields or some kind of crystalline based lifeform which seems unlikely since they ingest carbon based food. Alice and Sedna are obviously lab grown or manufactured constructs, they have to be. Her hair grows so there's obviously some kind of repair/maintenance going on. Whether she and Sedna are crystalline, carbon or metal based tech is irrelevant they are artificial life constructs. The only reason (I can see) they would not have wiped out in the blink with the other AI was some sort of mentality detection and if they were advanced enough or close enough to human mentality (and they are) they made the cut. But physically they are super advanced constructs and still essentially self aware robots. No Alice and Sedna don't HAVE to be lab grown constructs. They could be highly modified naturally born humans. They could be a divergent evolutionary form that occured from breeding programs and genetic manipulation by the bio-faction humans. They could be demi-gods. They could be aliens. They could be a LOT of things. One of my readings of that is that the "new stars" are in fact all the orbital habitats. One of my readings of that is that the "new stars" are in fact all the oribital habitats. In re-reading Alice's short form history on the conflict you are correct. The new stars are not stars but orbital habitats. The combatants were separated and the thinking trees "Praeses" appear to be the (alien?) entities responsible for the teleportation and instant terraforming. If that's the case the door opens not just for extensions of current technology but ultra-high alien tech which is (or can be) effectively akin (plot wise) to magic. In re-reading Alice's short form history on the conflict you are correct. The new stars are not stars but orbital habitats. The combatants were separated. and the thinking trees "Praeses" appear to be the (alien?) entities responsible for the teleportation and instant terraforming. The word effectively means "governor of a colony". What a coincidence, eh? If, as you say, the Praesides did it, they were ultra-powerful godlike aliens living elsewhere at the time. If so, they must be really bored by now having to babysit space colonies of deliberately-kept-ignorant ex-Earth creatures for 5000 years. A more reasonable and non-magic explanation to my mind is that there's exactly one Godlike Entity that did the Blink. It also fetched the Praesides from wherever they lived before and put them in charge of the colonies, possibly for compensation. * The planet it was living on was at war, and that was a risk to its own existence, and it had better do something about that, right quick. * Any future AI could in theory also bootstrap itself into godlike intelligence, which would also be a threat to its own existence, so it had better eliminate all the other AIs, also right quick. Hence the Blink. Hence, also, the idea for the Praesides to insist to the colonists that AI was impossible. If that's the case the door opens not just for extensions of current technology but ultra-high alien tech which is (or can be) effectively akin (plot wise) to magic. True, but that's why this godlike entity has kept itself out of sight for the last 5000 years, and may continue to do so. It not only screws with the plot to have it around, it probably has better things to worry about. P.S. If I'm right about the Singularity, this also explains why Alice can't be an AI: the Godlike Entity permits no competition. Why AIs as opposed to organic intelligences? Because AIs can, in theory, rewrite their own code. Yeah, that sounds like he's a Hunter of Super-Soldiers, all right. Something so strong that Alice thinks that he'd take down her and Sedna even if they took him on together. She also clearly thinks that he's likely still got his programming to hunt and kill them running. Alice said her level of bad news which could mean numerous things, but what we can coclude is that Alice recognizes him, but he doesn't recognize her or is just pretending and considering that 2 immortals like Alice are no match for him he is indeed very powerful. Of course this is a really big setback for the plan to return Ardent and Gavia home. It was always too early for that to happen. The most I was really expecting to happen was for them to find some kind of tool that they needed or some kind of information that lead Alice to revise slightly her understanding of what happened during the Blink. It does not necessarily mean he is stronger than them - maybe defeating him would just expend a considerable amount of resources. Something like sending each of them into a coma for a year or so... anything could happen during that time. Depends on where this story is ultimately going. They could arrive at the space habitat and be there for a few chapters. Anything could happen. Alice's plan may go off without a hitch and they'll get away, but the divide in Ardent and Gavia's relationship will just increase. Or Arent or Gavia will inform Mr. Pate what Alice is planning to do and the big guy intervenes. I know a lot of people think Gavia would do that because she's desperate to get home, but she also seems wary of her surroundings and would rather trust the devil she knows, Alice than the devil she doesn't, Pate. Moreover, that conversation with Ardent makes me think she's slowly resigning herself to a fate of being marooned on Earth and would rather stay alive than trust a potentially dangerous human. Ardent on the other hand feels really guilty about what he did and gullible enough to trust someone like Pate so I can see him betraying the plan because he thinks he's making things right. Or the big guy recognizes Alice and Sedna and while not visibly reacting has already anticipated their next move. Well, now I know how frightened Alice is. I await the next comic to see if Alice knows the guy personally. I'm inclined to think yes. If she didn't know him, I don't see a good reason as to why she'd be frightened of another person on her level, instead of saying: "Oh hi, how are you? I don't think we've met before, which strikes me as strange considering how alike we are." Unless the conflict from the two opposing factions of humanity was so terrible she assumes everyone on her level she doesn't know was on the opposite side and must be feared on principle.